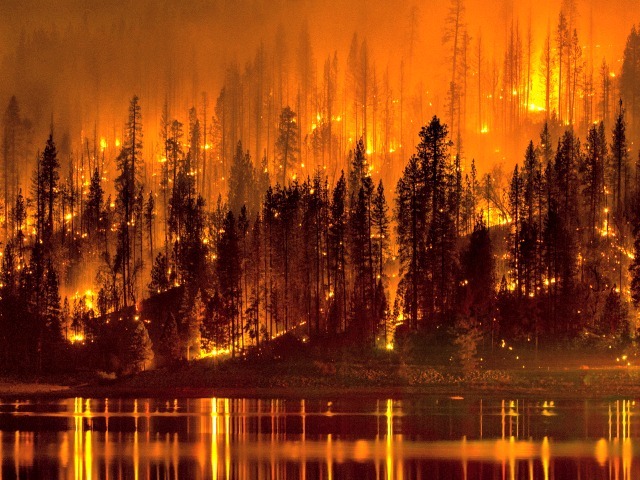 Only 10% contained and doubling in size overnight to 114 square miles, the raging blaze in the forest east of Sacramento has burned 80,000 acres and has led to the evacuation of almost 3,000 people. The Los Angeles Times reported that over 7,6oo firefighters are working to put out flames in nine wildfires across California, yet the torching going on in El Dorado County, known as the King fire, is the most dangerous. The fire was allegedly ignited last Saturday by Wayne Huntsman, 37, who is in custody and being held in lieu of $10 million bail. Due to extremely dry, dense vegetation and an absence of any significant fires there since 1992, the El Dorado National Forest is particularly vulnerable to this kind of fiery mayhem, officials explained. Cal Fire Unit Chief Mike Kaslin insists that that firefighters are “literally setting a world record with respect to retardant drops” on the fire. The Times reported that firefighters have pumped more than 450,000 gallons of fire retardant from Sacramento, dropping 210,000 gallons on Wednesday alone.